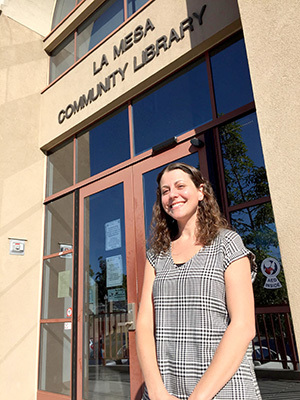 Rancho San Diego native Chelsie Harris says she was “born and raised out here” in East County, making her new gig as managing librarian for the La Mesa Library a sort of homecoming. Harris has been with the San Diego County Library for 12 years, starting as a student worker while she attended college. Harris worked at the El Cajon and Encinitas branches, the county library headquarters in the community relations department, and for the last three years as manager at the Ramona Library before taking over La Mesa Library from outgoing managing librarian Heather Pisani-Kristl. So far, Harris said, she is enjoying her new job. “The community is really great and the staff here is amazing so I’m really excited,” she said. As far as changes to library programs, Harris said she is getting a feel for what the community wants and encourages people to come in with suggestions or share what programs they enjoy at other libraries. Harris is already a supporter of expanding the La Mesa Library. 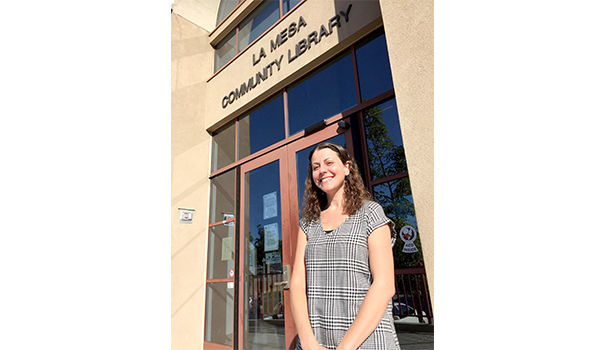 She said a library combined with a performing arts center, as some have suggested for La Mesa, could meet some of the library’s needs, but that she would prefer adding quiet study rooms, which are the most requested amenity the La Mesa Library does not offer. Harris said she envisions the library as the “third place” for members of the community. Welcome, Chelsie! It’s so nice to have you here in La Mesa, welcoming ideas for new programming and recognizing need to expand the physical space of our library. You should know best: you’re there most every day. And I love your “third place” vision for the library, which can become a central “community anchor” if we as a community work together to create it. I agree with Bonnie. We really need to build our La Mesa Library into a community focal point for reading, information-gathering, community lectures, meeting rooms, and home-away-from-home space. An adjacent performance venue and community gathering plaza would complete the picture. Welcome to Chelsie and her vision of a library that serves as the heart of the city. I so agree. La Mesa’s library is used so much, and yet has so little space for that use. We need to expand the library to meet our community’s needs. It should be our city’s priority. Our library is there for all age groups, which when you visit, you can readily see. There are so many more services and programs it could provide. Let’s do it!